Yesterday I had the pleasure of attending a course at the Mt. Cuba Center. It was myself, a friend, and 12 other people. After witnessing the sights I saw there I can't help feeling there's something wrong with the world. The cost of admission was $10 and includes a two hour tour of the gardens and a free plant at the end of it. Had I known only 14 people were going to show up I'd have tried a lot harder to get more friends to join me. Mt. Cuba has a certain stigma in the gardening circle I'm in. 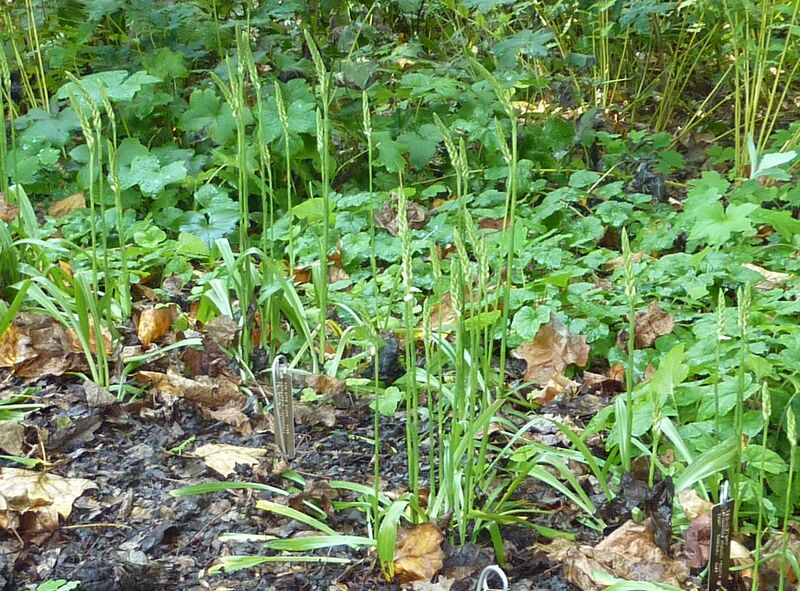 Basically everyone agrees that because they're in a woodland setting they have a lot more is blooming in the spring time when the majority of full shade plants bloom. They're right of course but that's no reason to miss out on learning. Earlier this year I went to the Philadelphia Flower Show (the largest flower show of it's kind in North America!) and I went to Mt. Cuba Center's Spring Wildflower Celebration. Philadelphia Flower Show - $26 dollars and I felt ripped off. Mt. Cuba Wildflower Celebration - Free and they hand you a plant for being in the first 500 people... I left there feeling like I must have spent $50 to get in. Maybe it's just the medium but Mt. Cuba was so much better on so many levels. There's something about walking through an actual garden that carries a single theme of colors and views the whole way through that never fails to be awe inspiring. Where as the Philadelphia Flower show is like walking through a massive garage of broke down parade floats. Flowers are arranged for design ascetic and views. Plants from far off parts of the world are highlighted without any regard or consideration for the environment. I suppose this highlights a difference between non-prophet organizations and landscaping businesses. My point is having more flowers isn't necessarily better. This was the first time I've been to Mt. Cuba in the late summer/fall time. And I'm happy to say I had just as nice a time as in the spring. My day began resting on the terrace waiting for the class to begin. 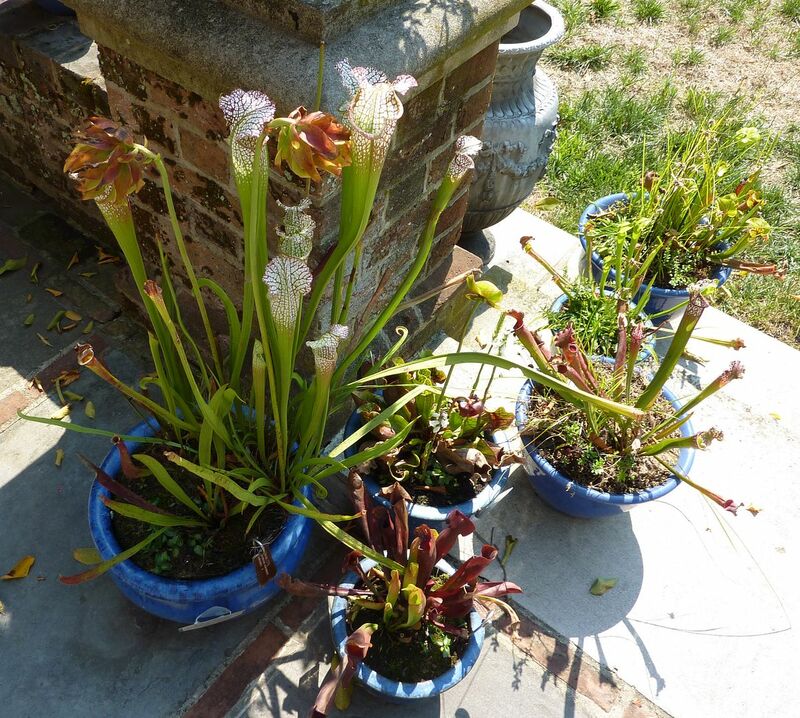 Their pots of carnivorous plants were still out and as carnivorous as ever. I was surprised to see many of them were still blooming, although maybe it's just the fact they're still in pots. I don't know how stressed flowering works in these plants. 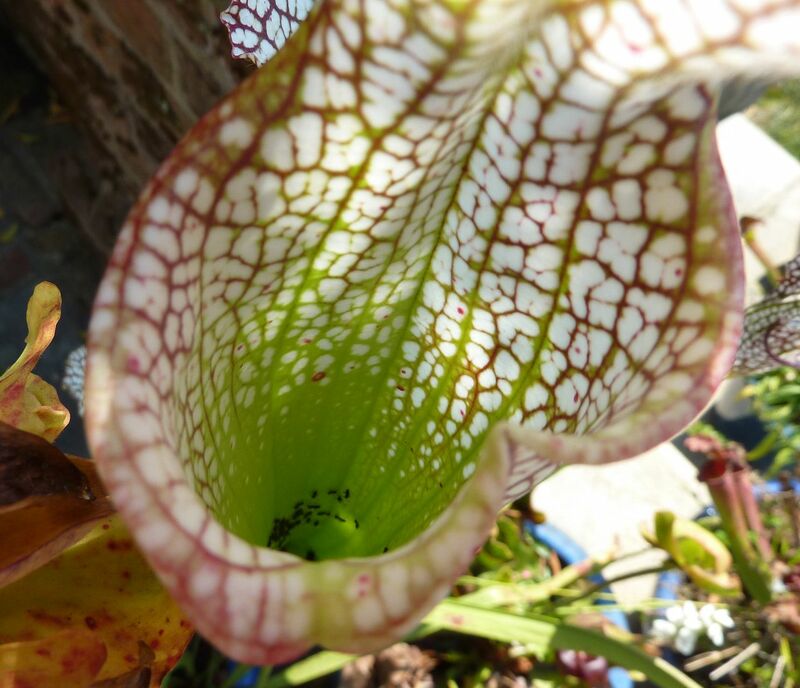 The flowers to various pitcher plants feature a safety net to help prevent the pollinator from falling into the pitchers below. Glancing inside I spied dozens of ants. All of which were alive to my surprise. Tapinoma sessile, The odorous house ant. 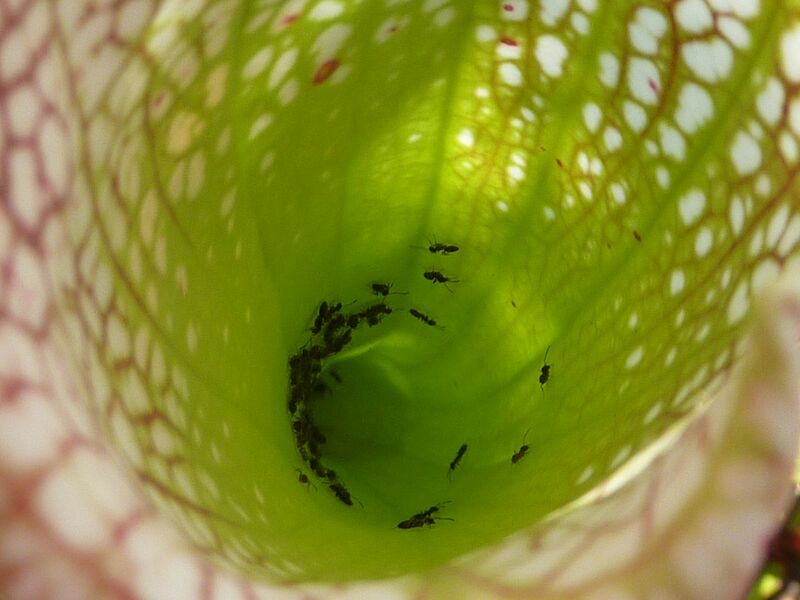 I didn't get to stay long enough to see if they were just trapped or somehow treating the pitcher as a food source. 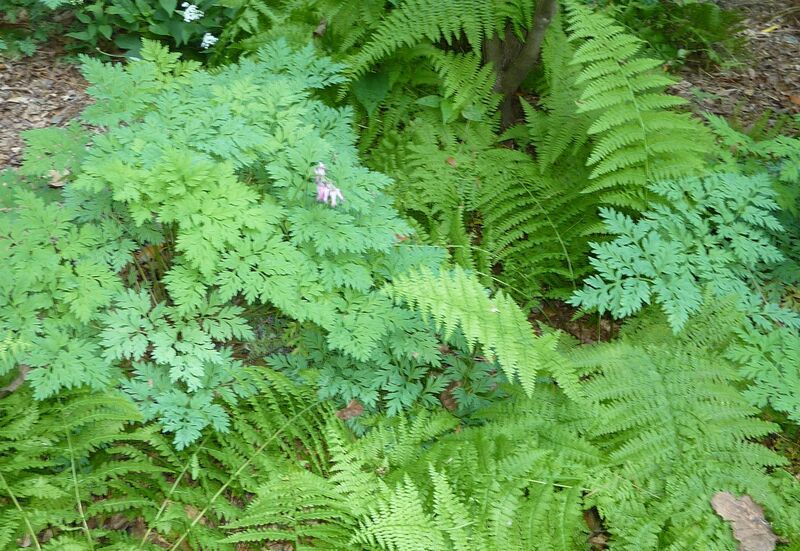 Starting the tour, one of the first plants highlighted was Dicentra eximia, Wild Bleeding-Heart. They go well with ferns but notice how it's still blooming! I'd originally shied away from this species when picking out a bleeding heart for the front garden. I favored one who's flowers looked more heart shaped. Normally these bloom like crazy in the spring but this species will start to bloom again in the fall time. Collinsonia canadensis, horse balm. 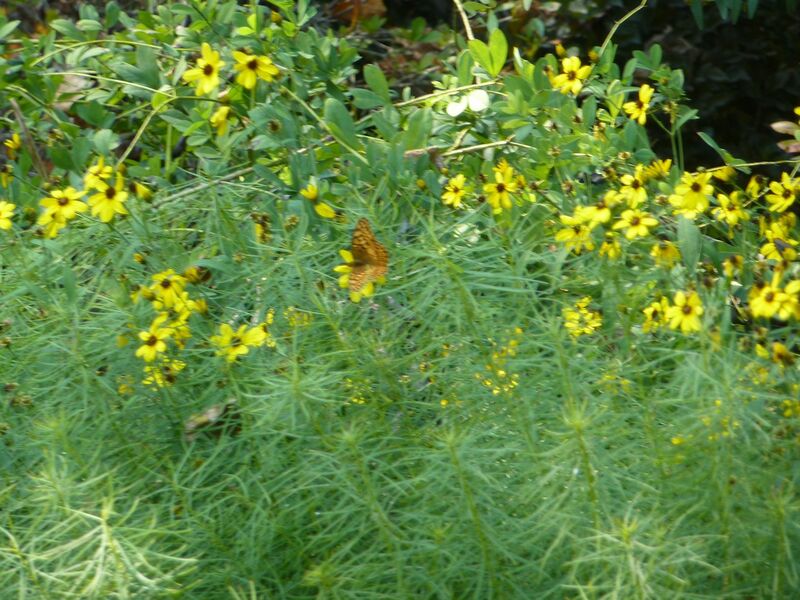 This is the big leaf plant in the middle with all the tall spires of small yellow flowers. I'm not that crazy about the flowers or the plant in particular. 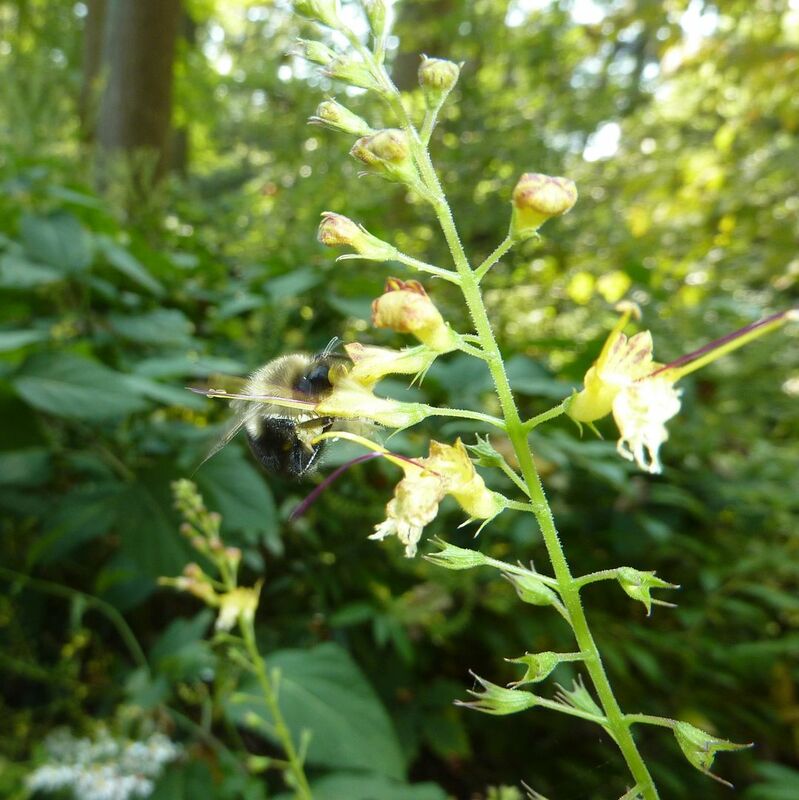 But yah know I've always wanted to get my beekeeper friends to plant more natives and have been looking for a shade tolerant nectar source. This could be it. I may give it a try. Spiranthes odorata, Fragrant Ladies-Tresses. This is a native orchid ... on a very bad day, it's been excessively hot and dry for the whole area. Here is a google image search for what they should look like. The flowers put on quite a show but are a little small for my taste. They are fragrant but I wasn't able to get close enough to them. As for the "Tresses" they don't really look like hair to me and I question the origin of this common name. They might go good next to a pond area where one can sit down and relax. 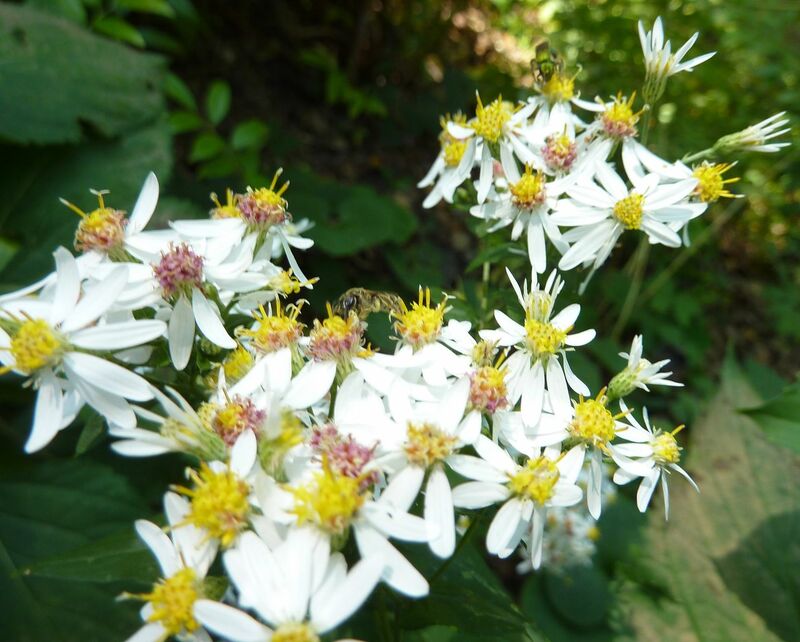 Eurybia divaricata, White Wood Aster. 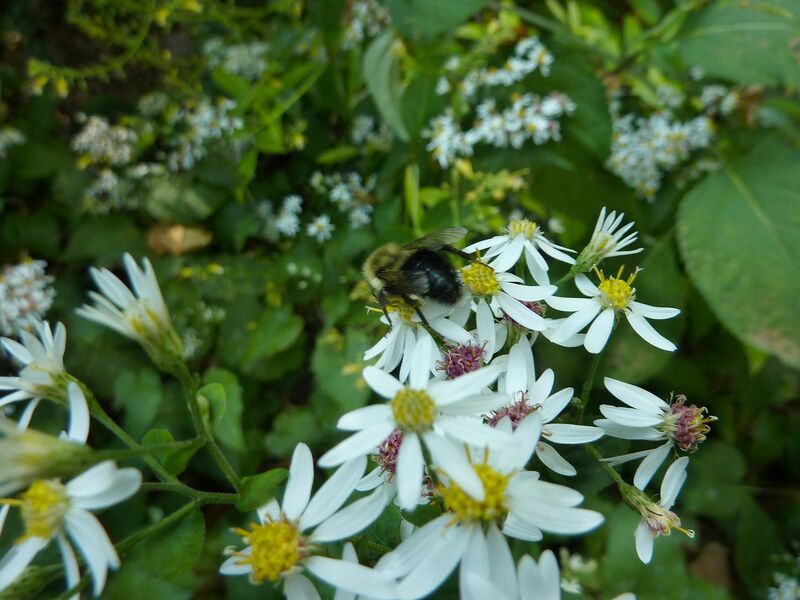 While we're on the topic of our first aster let me say Asters of North America are now all Asters by common name only. A rather helpful hand out lists all the genera Asters are now put in. 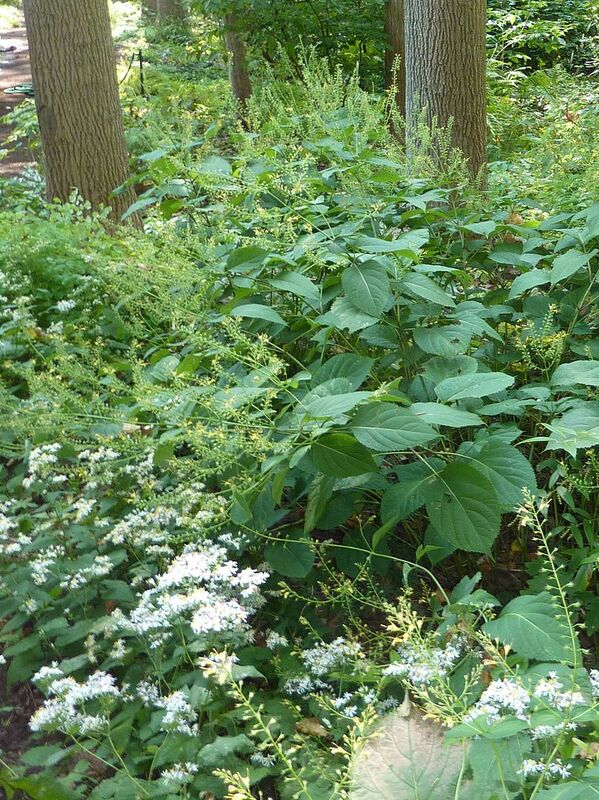 This white woodland aster is quite common in the area. I know I have several species that reseed all on their own all over my yard. They're easy to grow but don't spread to much to be weedy. 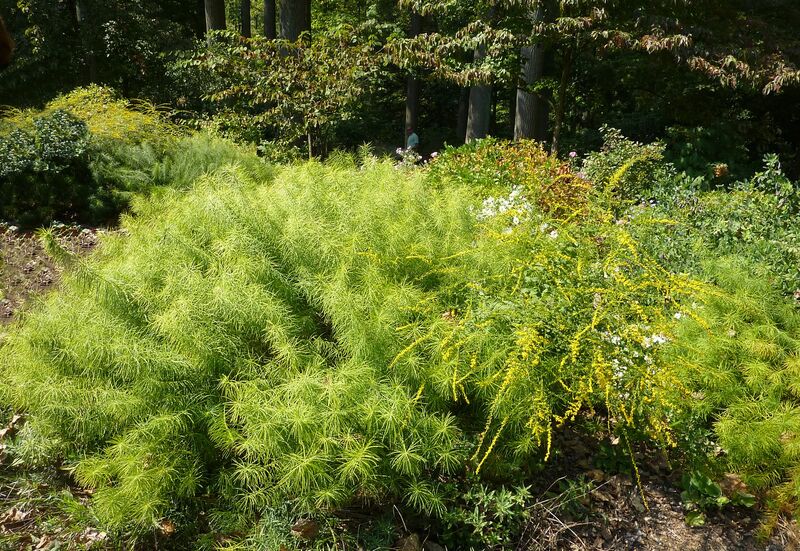 To the left here is the awesome foliage to Amsonia hubrichtii, what they're calling Hubricht's Blue Star. Arkansas Blue Star is another one. 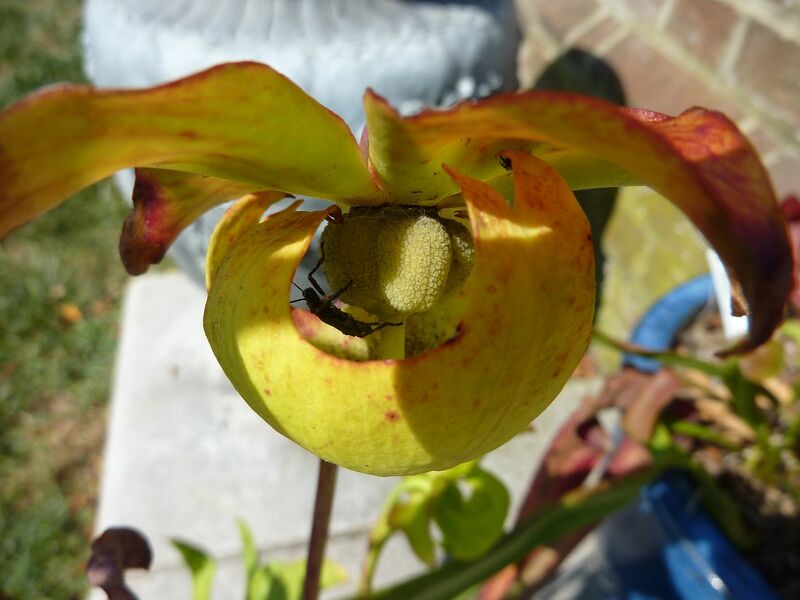 In the spring time this plant comes up thinly with lots of blue five pointed flowers. As the summer goes on it turns into this shaggy cloud of wonderful foliage. I just want to lay in it. Very cool plant and there are other Amsonia that are native to more parts of the country but I'm not sure they're as thick and full looking. 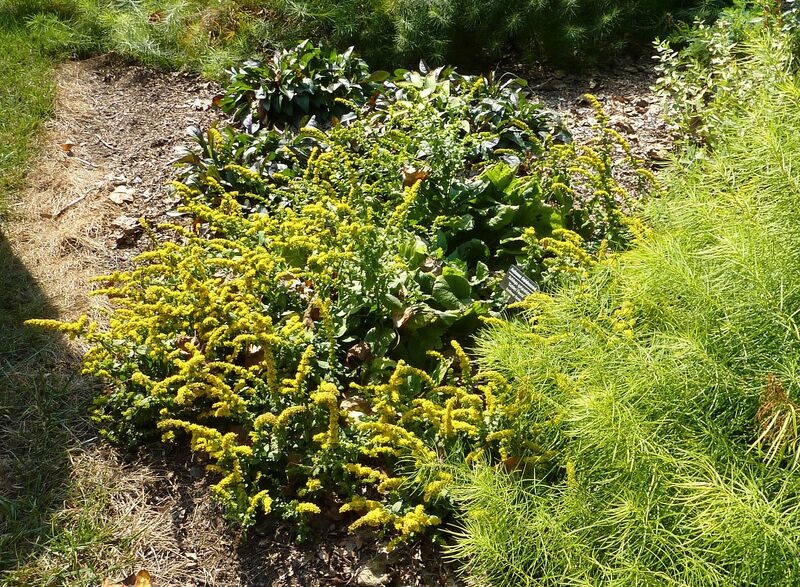 This Goldenrod ground cover is Solidago sphacelata, Autumn Goldenrod. 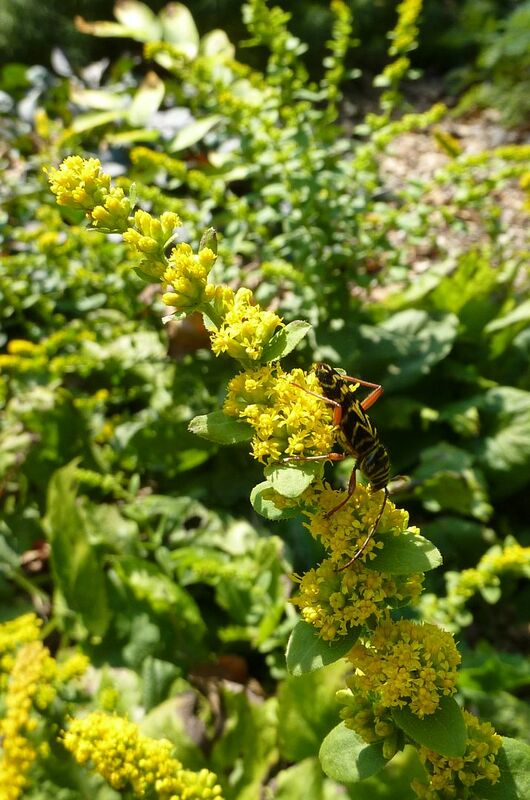 For those of you tired of those towering goldenrods that are 5' to 10' tall, this is the ground cover for you. 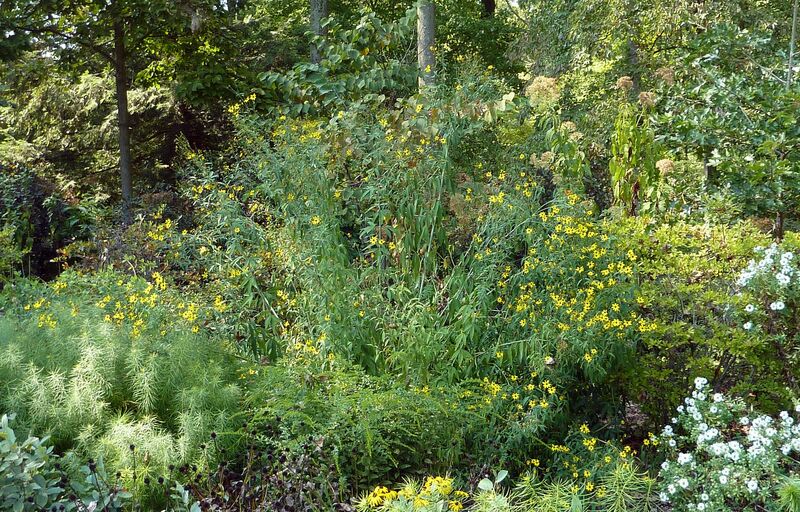 Now that I realize there's this size distance of Solidago's I'm tempted to make a garden of nothing but them.... which is a lot of yellow. This was also the plant everyone who took the class got for free. This huge plant in the background I thought was a perennial sunflower even after the tour guide kept calling it a Coreopsis. But then I had a closer look and realized oh my god that seriously is Coreopsis that isn't 2' tall. Coreopsis tripteris, Tall Tickseed. This Goliath of the garden is going on my list for spring of next year! It's huge but the foliage is light and airy as you'd expect from a Coreopsis. Assorted checkerspot butterflies were dancing around it and some ironweed (no photos sorry). The only downside I believe is it might be one of those plants that gets too tall and falls over on everything. Tomorrow comes part 2 hopefully. There were lots of other plants I didn't get to photograph or did but the images didn't turn out as I'd like.